ANNA DELLO RUSSO FOR H&M UPDATE! After a week of anxiously waiting for the postman, my precious jewels finally arrived on Friday afternoon! I was so excited to receive the parcel and upon seeing the HUGE box they arrived in, I was even more eager to get my mits on its contents. 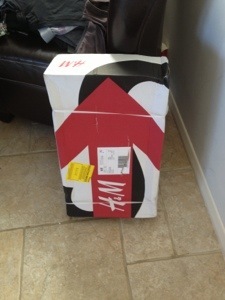 Box open, and I am met with miles upon miles of foam padding (good sign) and the gorgeous custom-designed AdR for H&M boxes housing the beauuuuuuutiful accessories! 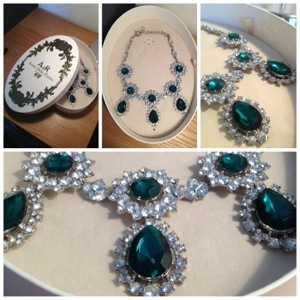 The emerald necklace… What can I say about the emerald necklace?! The photographs DO NOT do this piece any justice at all. The stones are actually more ‘green’ in person than what the camera shows, also more sparklicious than what the camera is able to portray, actually, bear that in mind for ALL of the pieces. THE CAMERA DOES NOT DO THEM JUSTICE. Are we clear? Good. In all honesty, this necklace was the one piece that I was the most excited about. And I was certainly not disappointed. With the capabilities of transforming absolutely any outfit, this necklace is the mother of all necklaces. It has the ability to make anyone feel regal or like an Old Hollywood movie star, Elizabeth Taylor-style. I simply cannot see a time when I will ever grow bored of looking at this necklace, let alone wearing it! It’s wearability is not for everyone, however if you’re like me and live for fashion and are convinced you were a magpie in a previous life, then you too will adore it. For the price of this (£29.99), I feel that it is extremely high quality, the clasp feels exceptionally sturdy and unbreakable and also, it’s box and lid are both padded all round, giving the whole experience an even more luxurious feel. 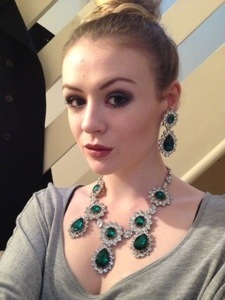 The second item is the pair of emerald earring that match the necklace. 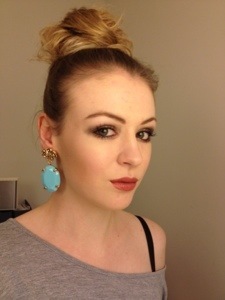 Exactly like the necklace, these earrings are extremely high quality, sparkly, jazzy and all-round fabulous. Surprisingly lightweight, these are very comfortable to wear and before I received them, I was worried that they would be quite weighty and uncomfortable to wear, au contrare!! 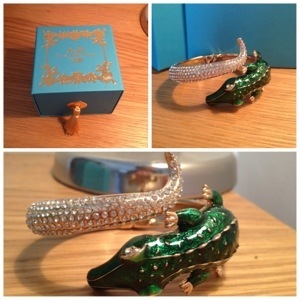 Next, is this green and gold crocodile bangle. 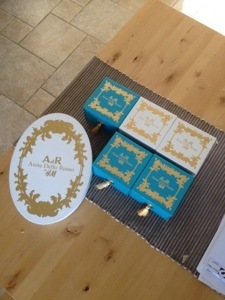 The box is the same style as before, only in turquoise and gold. As for the bangle, I really love the quality and how vibrant the green is, there is also a metal elastic acted section to allow you to wear it on the upper part of your arm too. Also, I love the way the tail of the crocodile curves up the arm, which is covered in hundreds of diamonté studs. 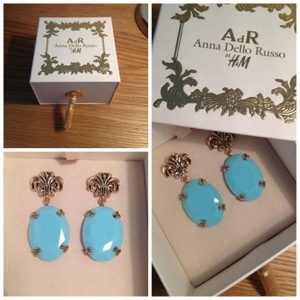 These are the other earrings I bough, again in a cream and gold box. The earrings are again surprisingly lightweight and comfortable to wear. 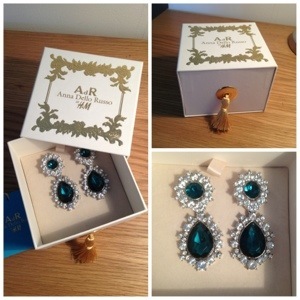 The earrings when on are actually larger than they appear in the photographs in the box. Another detail I noticed about both pairs of earrings I bought is that the turquoise and gold pair had a matching gold back to the earrings and my emerald pair had a silver back. It is the minor details like this that I notice and make me even more excited in the most geeky way possible! 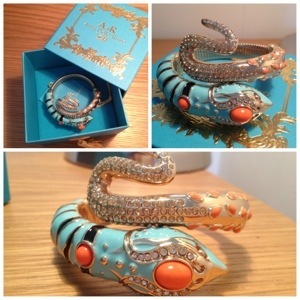 Neeeeeeext is the absolutely divine gold, orange and turquoise snake bangle. I absolutely ADORE this bangle! I really love the contrasting colour combination and the way the tail curls up the arm. Again, there is a metal elastic acted section for ease of wear and also for the ability of wearing on the upper arm. This is also encrusted with diamontés which catch the light and makes for a really striking piece. Lastly is this gorgeous triple snake bracelet with green glass enamel and silver and turquoise detailing. 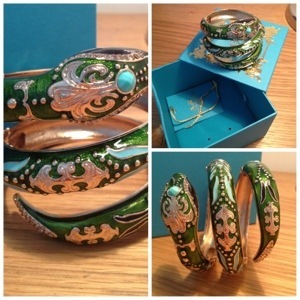 Again, presented in a turquoise and gold box, the bangle is a treat. Again, the quality defies the price (£34.99) and again, this will transform an outfit. Here is me wearing all three bangles in different lights. You can really see how the light captures each piece. All in all I couldn’t be happier with the AdR jewellery, I only wish I had the funds to have purchased more from the collection! Having been a fan of No Doubt since I was 11, you can imagine my excitement when it was announced around four years ago that the band were in the studio recording their sixth studio album. For any die-hard fan, this is a BIG DEAL, but No Doubt’s last official studio release was Rock Steady in 2001, making this album extra special. This was the day that No Doubt’s sixth studio album Push and Shove was released in the UK. It is also the day after the band arrive in the UK after a short promotional stop in Paris. 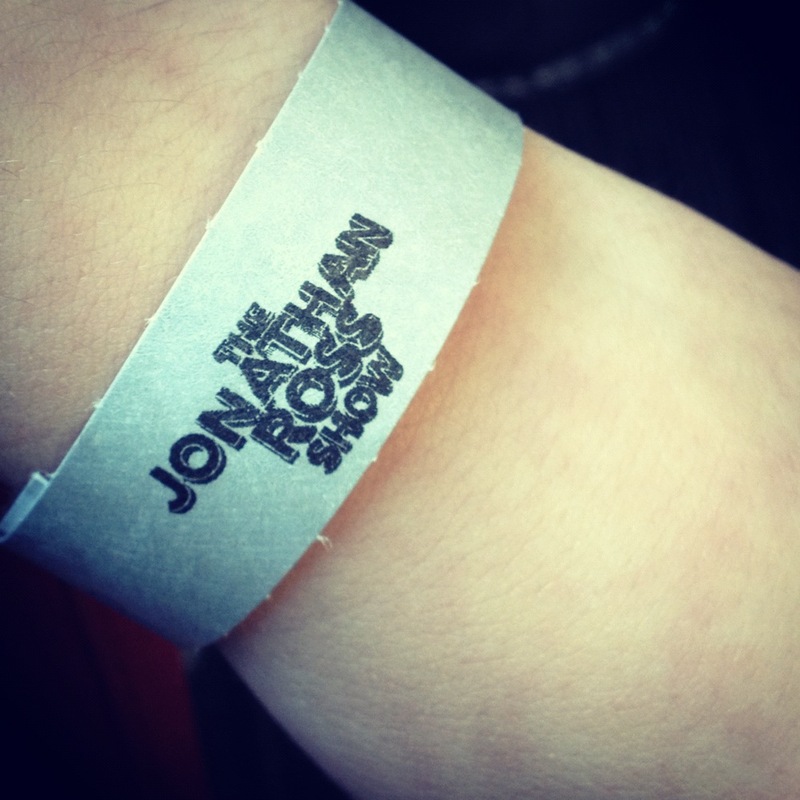 It was also announced a few days before that the band would be appearing on The Jonathan Ross Show. Since that had been announced, I had been trying to get myself tickets from an online TV show ticket company, but to no avail. All the tickets had already been allocated. Last October when Lady Gaga appeared on The Jonathan Ross Show, I was also desperately trying to get tickets, again to no avail. So I went on Twitter the night they filmed the show (not just a one-off Twitter session, but because Twitter is my life… No joke) and noticed that Jonathan Ross was tweeting Gaga fans about the show that had just wrapped. 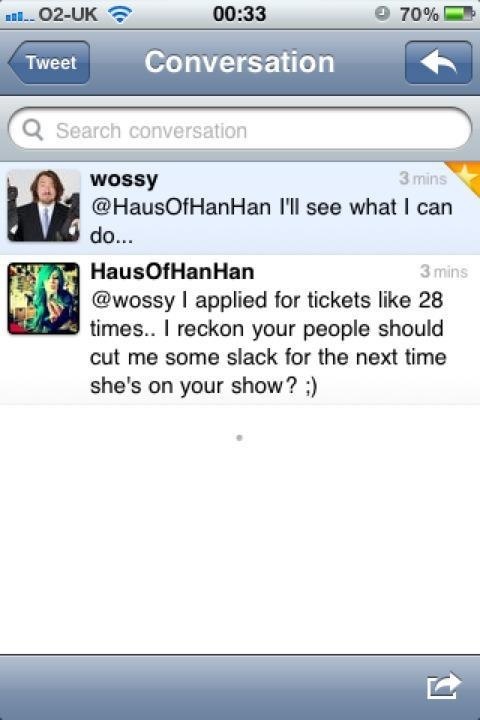 I took this opportunity to ask the man himself if he could send tickets my way next time she was on the show. Not thinking that he would even so much as see my tweet, seeing as he has millions of followers, but he actually replied saying he would “see what I can do”, he also followed me. So here we are, almost a year later and my favourite band, No Doubt, are going on the show… And I can’t get tickets. As a last resort, I decide to send Jonathan a DM on Twitter explaining that I am a huuuuuuge No Doubt fan and that I have been trying and trying for tickets but have been unsuccessful. Not only did he reply, but he gave me two tickets and told me to message him back with my contact details and someone from his office would ring me the next day. Bingo! Ecstatic, I’m on a high. There’s only one problem… Jonathan Ross is a busy man, will he forget? I go to bed that night excited yet nervous. I wake up and instinctively check my phone. I do this anyway, but today would be even more of a obsessive-compulsive phone-checking day. Still no word. Losing hope and faith in Jonathan Ross, I beg my mum to ring his office and explain the situation… Although to be honest, the “I spoke to Jonathan himself yesterday” card seemed a bit weak and unbelievable. After a few wrong numbers, we were finally put through to Jonathan Ross’ personal office and spoke to a nice lady called Katie who was lovely and was willing to do anything she could to help us. Katie said that Jonathan arrives at the studio with the “The List”. Now, when she said this, it reminded me of The Devil Wears Prada when they have to deliver “The Book”. It must be extremely covetable to be on “The List”. “The List” consists of people Jonathan has personally reserved seats for, but only when he turns up will they know if I’m on that list or not. My mum then explained that we’re coming from Cambridge and that we needed to leave in good time to make it to the studio; Katie said that she would get back to us. Katie from Jonathan Ross’ office rings back saying that she has notified Tom, the producer of the show, of the situation and would either have him or his assistant Verity ring me in the next hour with confirmation of tickets. Less than five minutes later, I get a phone call from Verity, the producer’s assistant confirming two tickets! Jonathan had just turned up to the studio with “The List” and I am on it! My name is on the production list! She said we had to arrive at the main desk of the ITV Studios between 5:00PM and 5:45PM where someone will be waiting to take us up to the studio. FINALLY en route to London, it’s fair to say both my mum and I are very excited! 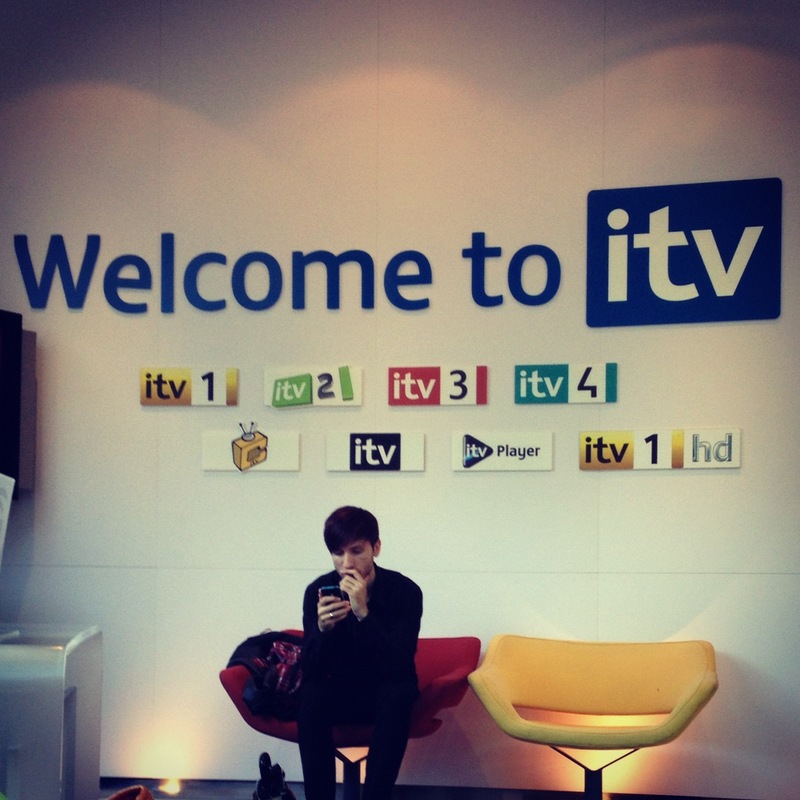 We arrive at the ITV Studios in Waterloo after stopping off for lunch, and are an hour early so we decided to sit and people-watch to pass the time away before heading to the reception desk. There’s paparazzi waiting outside the main entrance, which is always intriguing. We make our way over to the main door and sign in at the desk. We wait for a while on some chairs that looks like they were taken straight out of the Big Brother house circa 2002, and while waiting, we noticed some commotion going on outside. I turn around and see four cast members of The Only way Is Essex: Mario Falcone, Lucy Mecklenburgh, Billie Faiers and Joey Essex in all their fake tanned, platform heel glory. It is time for us to go up to the studio! We are taken in a lift up to Studio 5 where we are met with reserved seats, right next to Jonathan Ross’ daughter, Honey. While we’re all sat comfortably waiting in our seats, there are noticeably 6 seats empty in front of us. All at once, a man with a headset and notebook comes along with 6 people and a man with a camera. My mum and I looked at each other with horror as we realised we were right in the camera’s lens… *cue glance in compact and re-application of lipstick*. Turns out they were filming for a new show on Channel 4 called Mimic which is a comedy/drama. Showtime! No Doubt come out first and perform two small sections from the song Hella Good which is used for the opening and introduction to the show… This is the part where studio 5 in the ITV Studios was covered in my exploded body after taking in the fact that GWEN STEFANI was standing in front of me. The other guests on the show were Emma Watson (boring bore), Dynamo the magician (cool guy, strange talent) and Jack Dee (who, in my humble opinion, tries too hard by ironically not trying at all). Nonetheless, the show was very entertaining and No Doubt came back at the end to perform Settle Down which, I of course, loved! The taping finished at aroung 9:15 PM and it is fair to say that I thoroughly enjoyed my day, there is no faulting Jonathan Ross! In short, I woke up, panicked, spoke to the assistant producer of The Jonathan Ross Show, got tickets, bombed it to London, saw the TOWIE cast, was filmed for a Channel 4 drama and saw No Doubt live. Such a good day. What I love about Antonio Berardi is that you can always tell when a piece is his, without dispute. Impeccable tailoring, exquisite detailing and the elegant demeanour of his looks are all why I always love his catwalk shows. Berardi’s S/S13 show was as delightful as expected, no less. With his usual mix of glitzy-but-not-overdone cocktail dresses and clean lines with tailored pieces, the collection really is a Berardi-special. My particular favourites are the sequin-infested numbers which are cut to flatter any shape and bound to make anyone feel a million dollars, if its good enough for Nicole Kidman at this years’s EMMY awards, then it’s good enough for me! JEWELS GALORE: AdR X H&M HITS THE STORES. Just as Paris Fashion week closes (cue sobs of disdain from fashion junkies all over the blogosphere and beyond), Anna Dello Russo’s H&M accessories collection hit the shelves across the world and online. I was sat there this morning at my laptop, no doubt so were hundreds of other saddo’s, debit card at the ready, with my finger hitting the “refresh” button a dozen times a second waiting for the 9:00AM commencement of the year’s most anticipated high street collaboration. After many minutes of panicking, sweating and rushing (very attractive-sounding, I know) I was in!! I knew beforehand the pieces that I was desperate to have, coveting the baroque-glamour emerald earrings and necklace set and the gaaaaawjus snake jewel-encrusted bangles, so all-in-all I felt ready. You may be wondering why this seemingly simple task of purchasing a few things on the Internet is such a big sweat-fest. 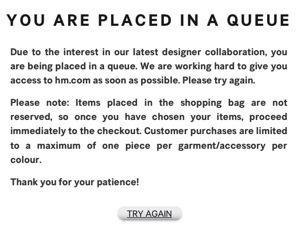 Well let me tell you, last November when H&M’s collaboration with Versace hit the stores, fans had been camped outside the flagship stores worldwide for 24 hours, with the online store crashing and the whole collection selling out in 30 MINUTES. While the AdR collection wasn’t quite as meticulously tedious in terms of the ridiculously fast selling-out times, the whole collection did however sell out online in three hours. So all-in-all I purchased six items from the collection, my coveted emerald earrings and necklace, a green snake bracelet, turquoise and orange snake bracelet, turquoise earrings and a crocodile bracelet with the end total coming to £148.84. Eye-watering for someone that isn’t supposed to be spending……….. But they’re so pretty. I have no regrets.